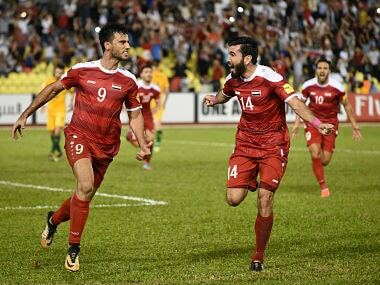 Malacca: Omar al-Soma's disputed late penalty kept Syria's World Cup dream alive on Thursday as they came from behind to draw 1-1 with Australia and set up a nerve-jangling play-off second leg in Sydney. Australia were left fuming by Soma's crucial spot-kick in the 85th minute, after the towering forward was nudged mid-air by Mathew Leckie and Iranian referee Alireza Faghani pointed to the spot. The Syrian striker, who has only recently returned to the war-wracked team after a long absence believed to be for political reasons, confidently swept his penalty past Mathew Ryan to leave the tie on a knife-edge. Syria, playing their 'home' games in Malaysia for security reasons, are seeking a fairy tale debut World Cup appearance, while Asian champions Australia are being made to squirm as they attempt to qualify for their fourth in a row. The eventual winners after Tuesday's second leg in Sydney will face the CONCACAF federation's fourth-placed team for a spot at next year's World Cup in Russia. Australia coach Ange Postecoglou said he was "bemused" by the late penalty decision, which cancelled out Robbie Kruse's first-half opener and came after Tomi Juric hit the same post twice in quick succession. "It's a bit disappointing to concede a goal the way we did from a decision," he said. "When a guy gets up and wins a header I'm a bit bemused, but it is what it is." Kruse was far less diplomatic when he was quoted by Fox Sports as saying: "It's never a pen, but you come to expect that in this (Asian) confederation." Both teams made a cagey start in front of a sparse but Syrian-dominated crowd in sultry conditions at the Hang Jebat Stadium in Malacca. Mark Milligan's fizzing shot with the outside of his left boot tested Mahmoud al-Youssef on 19 minutes, while Soma provided Syria's chief threat at the other end. Leckie blasted over on 29 minutes before Soma twice set up Omar Khribin for opportunities that the in-form Al Hilal striker put wide of the Australian goal. Five minutes before half-time, Leckie created Australia's opener when he received a ball down the right from Milos Degenek, cut inside and arrowed a shot which went in off the boot of Kruse. After the break, Juric was unlucky to see his shot come back off the woodwork and even unluckier when, bizarrely, he crashed the rebound off the same post. But Syria were looking dangerous and Khribin had a shot blocked by Leckie, before Soma headed a good chance over and was then denied an almost certain goal by Degenek's last-ditch lunge. As the game headed into the final quarter, Ouday Jaffal had a close-range free kick cleared off the line and Khribin's deflected set piece sailed just wide. Syria should have been level on 78 minutes but Soma's point-blank header was deflected onto the post in a reflex stop by Ryan. The critical moment came with six minutes to go, when Leckie made contact with Soma as they both leapt to head a high ball and Faghani blew for the penalty. In the dying exchanges, Trent Sainsbury had a close-range header saved and Ryan clawed away a Moayad al-Ajan shot, but they shared the spoils to set up Tuesday's tense decider in Sydney. "In the first half we weren't as good as we should, but in the second we took control of the match until the last minute," said Soma. 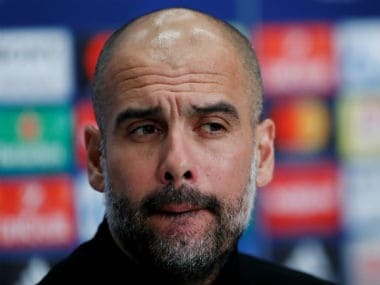 "The match in Australia will be difficult, in front of their supporters and at their home venue. but there's no impossible in football," he added.